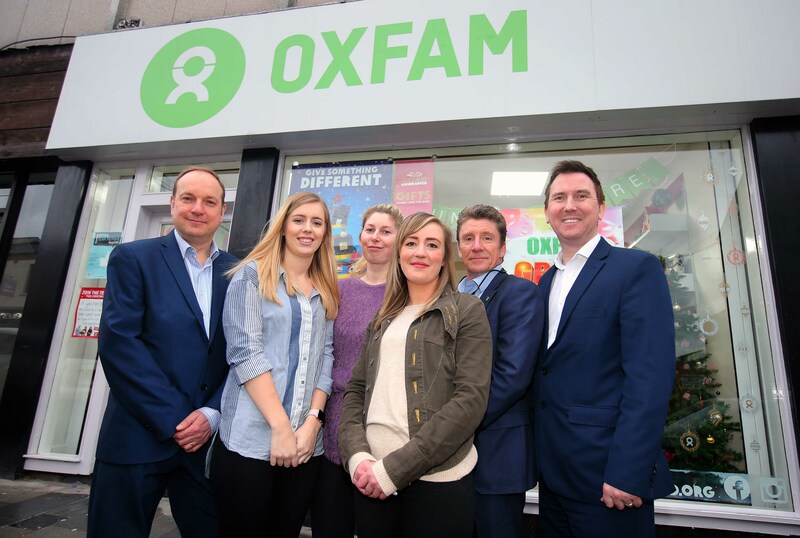 Oxfam proudly opened its new state-of-the-art shop in Ballymena on Thursday (13th December 2018) – and warmly invites the local community to come browse and buy, raising vital funds that will save and transform lives worldwide. 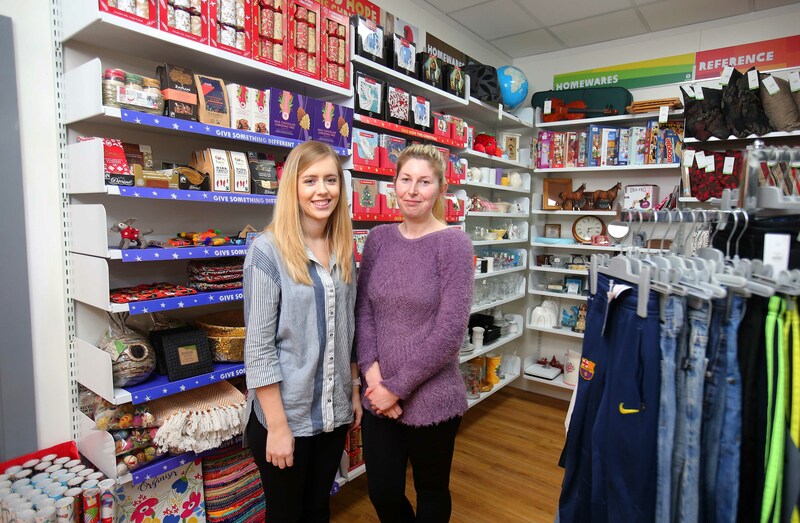 The new and larger shop is on 6-9 Wellington Street and Oxfam Ballymena store manager Rebecca McCoy said: “We are very excited about our ‘all-in-one’ shop, which boasts a larger floor area and is elegantly separated into 3 distinct zones. I’m sure people in Ballymena and beyond will be suitably impressed too! The shop is also currently offering Oxfam’s Christmas 2018 range of Fair Trade and ethically-sourced gifts and the Unwrapped gift card range that change and save lives while catering for all your Christmas essentials. 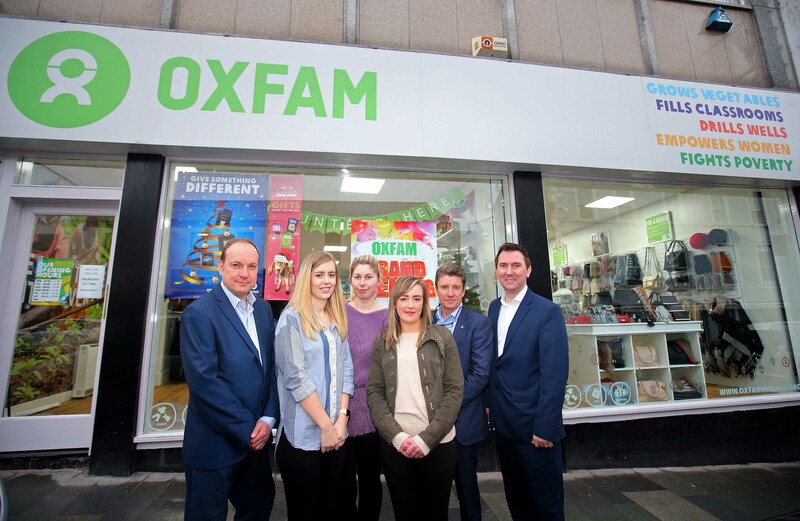 Rebecca McCoy added: “It’s great to have unwrapped and opened this shop just in time for Christmas – it’s like an early present for the people of Ballymena and for the vulnerable people Oxfam works with. Oxfam’s Ballymena store is also looking for additional enthusiastic volunteers to pledge their time and make a difference to the lives of people around the world. “It’s a great way to meet new people and gain new skills, as training will be provided,” said deputy shop manager Laura Gaston. If you are interested in volunteering, or wish to donate items for sale, please drop in to 6-9 Wellington Street, Ballymena or contact Rebecca or Laura on 028 2565 8341. Available in-store and online via oxfamireland.org/unwrapped, the Unwrapped gift card range starts at just £7 and support a wide range of life-changing projects. 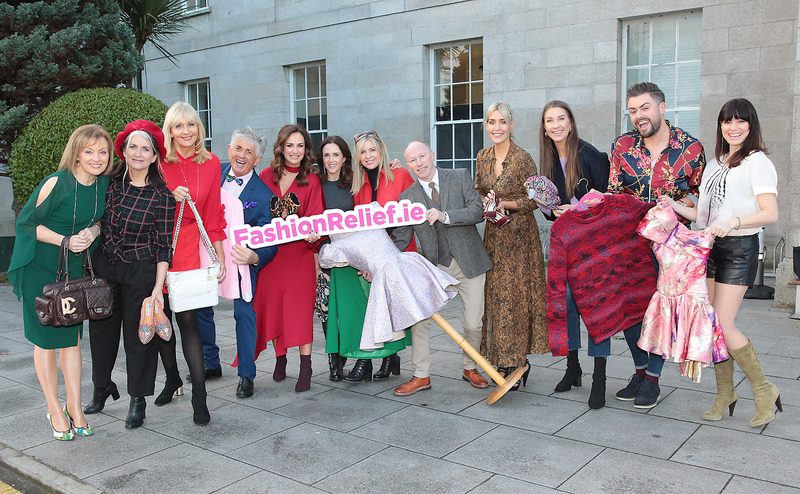 Give something different this Christmas with Oxfam Ireland – give a gift that changes lives for good. 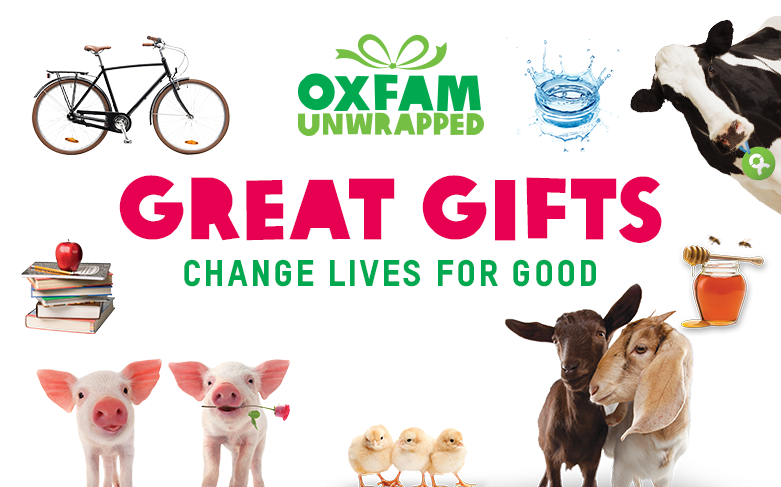 From quirky stocking fillers and ethically sourced crafts, to fab Fair Trade food, unique decorations and the Unwrapped alternative gift card range – Oxfam’s life-saving and life-changing gifts are the something special you’ve been looking for. These gifts are guaranteed to help beat poverty for good by raising vital funds for Oxfam’s work across the world – from development projects that change lives in Rwanda, Tanzania and beyond to saving lives in places like Yemen where millions of people face hunger and disease. Send your loved ones lots of hogs and kisses this year with the Unwrapped gift card range. Available online and in Oxfam shops across the island of Ireland, these beautiful printed or electronic cards start at just €10/£7 and support a wide range of life-changing projects. New additions for 2018 are Two Little Pigs (€40/£35), A Cow (€50/£46), or The Road to an Education (€65/£55). Every gift in the Unwrapped range helps to create a brighter, happier future for people living in severe poverty – from supporting people who depend on animals for their livelihoods and helping people get the education and training they need to thrive to ensuring people caught up in emergencies have essentials like clean water. To see Oxfam’s full range of Unwrapped gifts, visit oxfamireland.org/unwrapped. Meanwhile, in Oxfam shops nationwide, a host of Fair Trade and ethically-sourced gifts cater for all your Christmas essentials. There are brand new stocking fillers from €1.50/£1.20 like chocolate coins, mulled wine and spiced cider, retro games and novelty socks plus cards and gift-wrap paper. All of the quality food treats in-store are Fair Trade, so whether you choose from the new offerings of the Double Chocolate and Raspberry Shortbread (€5/£3.99), Beer Bread (choose from Chilli & Garlic or Olive & Rosemary, both €6/£4.99) or the Trio Sauce Set (Peri Peri chili sauce, Baobab spicy relish and Safari BBQ – €15/£12.99), these thoughtful present ideas will be sure to delight your foodie friends. Staying with food, Sally Butcher’s book Veggiestan (€20/£15.99) is a vegetable lover’s tour of the Middle East, while other reads include Cath Tate’s hilarious Christmas: The Season To Be Jolly (€7/£5.99), which pairs vintage photos with witty captions. Among the quirky new additions to Oxfam’s gift range for the home are the Recycled Tyre Picture Frame (€10/£7.99), colourful ceramic tile hooks (€4/£2.99), and a ‘nosey’ spectacles holder (€10/£7.99). New gifts for her include a Hand-made Embroidered Purse (€6/£4.99), a Hand-made Embroidered Pouch (€9/£6.99), 2019 Family Organisers (€10/£7.99) by either Ailsa Black or Clare Wilson, or how about some Belgian Pralines (€10/£8.49)? New gifts for him include a fascinating spotters guide book on the world’s top Film and TV Locations (€7/£5.99); and if that involves some travels then he will also appreciate the gift of a Hand-made Paisley Washbag (€9/£6.99). Younger children will love reading Hoot (€7/£5.99), a ‘hole-some book of counting’, while there are new additions to the Matchbox Trivia Games and Puzzles for kids of all ages (€5/£3.99). 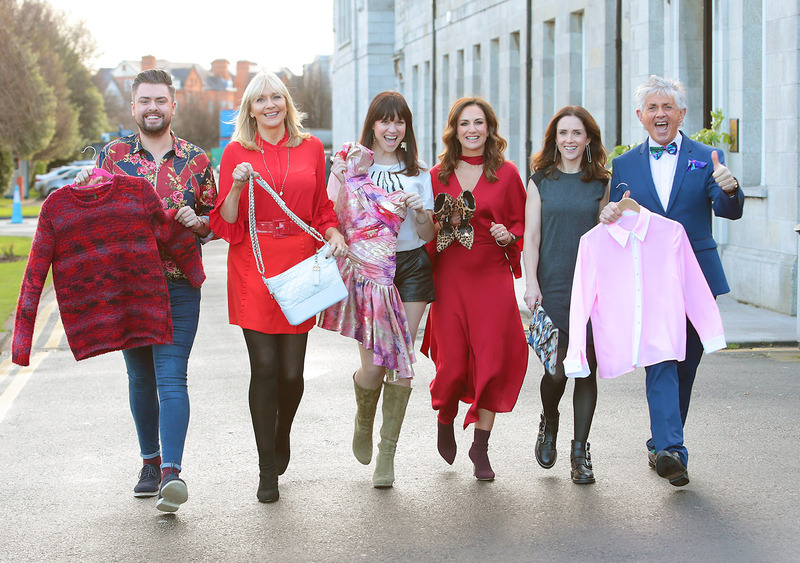 Give something different today: simply call into one of Oxfam’s shops across the island, phone 1850 30 40 55 (Republic of Ireland) or 0800 0 30 40 55 (Northern Ireland) or visit www.oxfamireland.org/unwrapped.